It doesn`t matter what type of slot machines you are playing but you will always face slots symbols. All slots players know that it is really important to pay attention to the symbols. 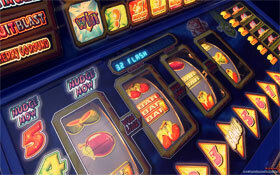 Every slot game has certain symbols which may influence winning combinations. Slots symbols can be of different types. The most typical are the following: fruits images, diamonds, bells, hearts. Today we can observe that a lot of new symbols are used at slot machines. It is caused by the constant civilization development. For example, with the increasing popularity of such cartoon as The Simpsons a lot of slot machines has appeared with the symbols that are represented by the icons reflecting the characters of the cartoon and all relative stuff. As you see the slots symbols can reflect any sphere of our life. This makes slots machines more and more attractive for different categories of players. Actually, we would like to tell you about the symbols which do influence your game while playing slot machines. Scatter symbols are the symbols that don't need to appear on one payline to be beneficial for a player. These symbols cannot be replaced by the wild symbol. Scatter symbols can trigger bonus games because they give extra winning chances and you do not have to pay for additional games, you even may win a high number of coins during this game. It is observed that bonus games have a nice graphics, a powerful sounding and not typical music, which is really attractive for a player. This type of symbols is usually represented by the icon that is similar to the theme of online slot. For instance, a slot with a beach theme may have such scatter symbol as a wave. In many games 2 scatters can double your winning on a certain spin; 3 scatters can quadruple. To make it more clear, scatter symbols only generate what you win. They say nothing about the type of your winning. There is one negative aspect about this type. If you do not win any money, the multiplier is not very good for you. Such slots symbols have a high percentage payout. They usually generate a lot of paylines. This feature makes them different from other symbols. Wild symbols are very important as they definitely improve your game. These symbols substitute for other symbols. In most games wild symbols are multipliers. It is very simple! In case of winning combination your payout is multiplied and it can`t be unpleasant!